Bart San Diego. Photo by David Toerge. As Bay Area people know, we often have a beautiful and long Indian summer, with clear weather lasting through October. But depending on where you are in the region, that can mean a lot of sunlight pounding down through those big Eichler windows. After that it's going to get cold, and we'll need insulation there. So it's a good time to be thinking about window coverings and the systems that govern them, which is the topic of this week's 'Ask an Expert,' with Bart San Diego of Rebarts Interiors, based in Burlingame and San Carlos. After thumbing through our last big feature on window treatments, from December 2009, I got to wondering what, if anything, had changed over the last four years. As it turns out, plenty: Technology has made it cheaper for us to have the kind of control over motorized drapes that once required extensive wiring and a control panel. Two things have made this possible, San Diego explained: New motors from Hunter Douglas, and an iPhone / iPad app that can program them all for up to a week. The PowerRise motor, ranging from $300 to $450 (but currently on sale), runs on standard AA batteries that make wiring unnecessary. "If you just use them twice a day, raising in the morning and closing at night, batteries will last conservatively 12 to 14 months," San Diego said. There's also an AC adaptor, but using batteries means no dangling cords. The Platinum app, meanwhile, replicates the function of a central control panel, and can be programed with settings a week in advance. 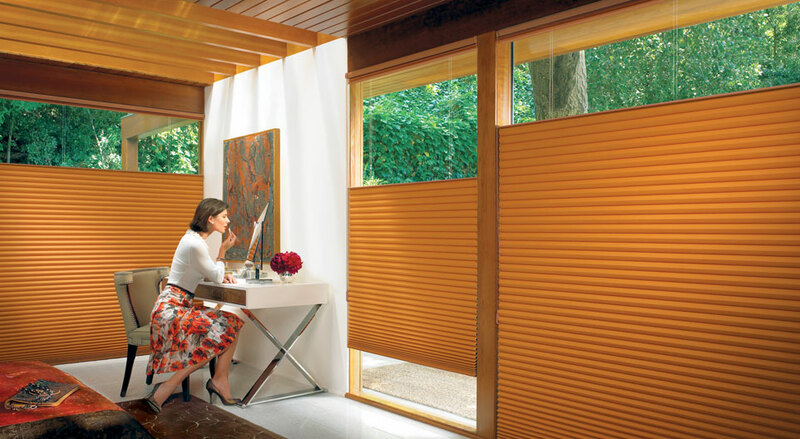 Duette Architella, courtesy of Hunter Douglas. With the cold weather not far off in the future, San Diego also recommended Hunter Douglas's insulating Duette Architella, a honeycomb-style shade that's "so energy efficient it's the only product within the whole Hunter Douglas line where you can get a federal tax credit." 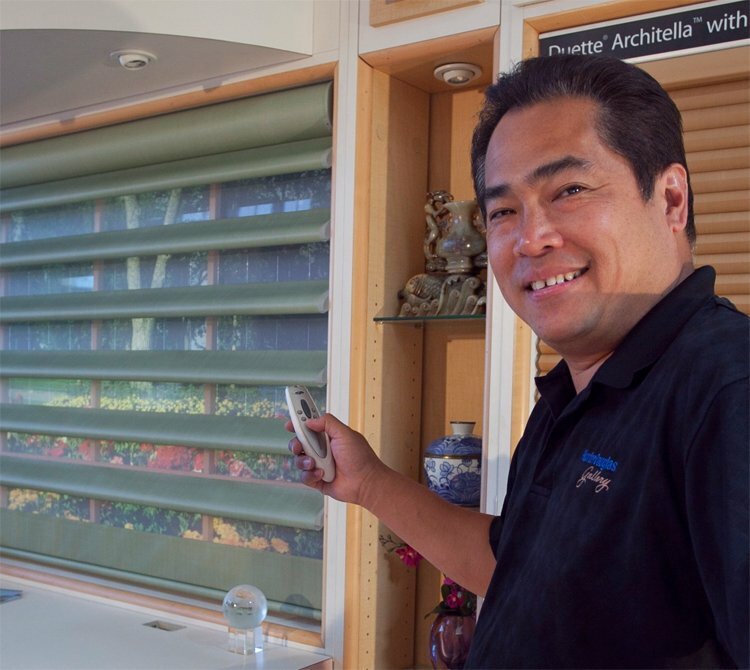 The Duette Architella shades compress to a pretty low profile, so they can fit in the tight spaces around Eichler windows, San Diego said. And the shades help prevent heat loss through those big pane windows. "Most Eichlers have single-pane windows so it really helps insulate the house without paying $30,000 to change windows to double-pane."